Deposit Methods: Bank Wire Transfer, Check, Maestro, MasterCard, Visa, 1Pay, NETELLER, Skrill. Software: Amaya, Electracade, Evolution Gaming, Greentube, IGT Interactive, OpenBet, Playtech. 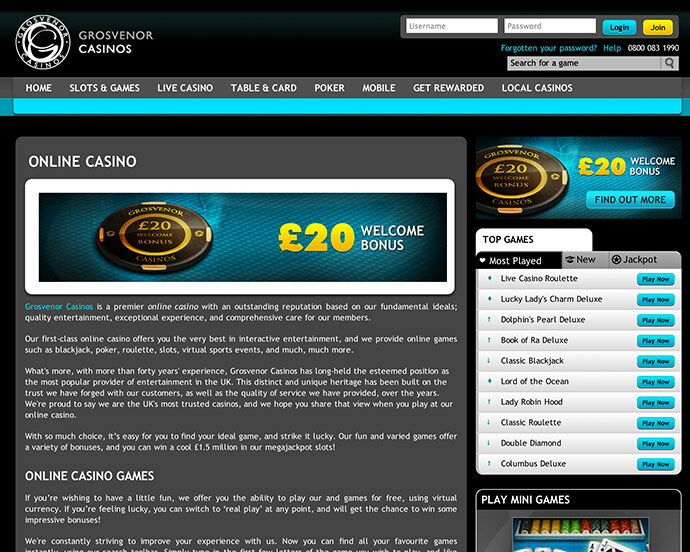 Grosvenor Casino offer over 100 top-quality games: you're sure to find one to suit you. Features such as classic games like roulette and blackjack, and gaming-floor shots from Grosvenor Casinos in Luton really help bring home a true casino experience. Players will find: safe and secure download, fast game play, massive progressive jackpots, comp points (reward you for every bet you place), exclusive download promotions, 24/7 dedicated customer service located in the UK.